9415: Conklin 10 Special: black hard rubber #1-size slip-cap crescent-filler, 12.9 cm long, nickel plated trim, imprints clear and strong; a rare and elusive model, to our knowledge not documented in any surviving catalog or advertisement -- many Conklin collectors are not even aware that Conklin made a #1-size pen. 13579: Conklin S6: oversize black hard rubber slip-cap crescent-filler, 13.6 cm long, uncommon #6 size, nib has flex but is missing tipping on one side, early narrow feed, unmarked crescent. Imprints are worn but legible, even fading to cap and barrel, lock ring is a darker and less faded replacement, original Conklin manufacture. 10175: Conklin P34: uncommon vest-pocket clipless crescent-filler in mottled hard rubber, 11 cm long, gold filled trim; model number denotes a #4-size pen with a #3 nib. Color good, imprints worn but mostly legible, nib tipping is partially missing on one side, nib can be used but is very scratchy; two small burn divots, one on barrel, one near cap lip, cap mouth has been internally sleeved to repair a lip hairline, which is now nearly invisible without magnification. 11678: Conklin 2: black hard rubber clipless crescent-filler with sterling silver filigree overlay, 10.7 cm long, raised threads, initials "M. L." engraved lightly and elegantly on the cap, scattered light marks but overall nice clean specimen, one end of lock ring chipped (see details). 5659: Conklin dummy pens: black-painted wood replicas of crescent-fillers, used for window displays instead of real pens so as to avoid risk of theft and of fading by sunlight; one looks like a capped pen, 13.7 cm long, the other an uncapped pen, lacking nib and feed; much scarcer than the actual pens, and much less common than dummy pens by makers such as Waterman, these display models are also sought after by collectors of advertising, country store items, and folk art. 10507: Conklin 2: black hard rubber crescent-filler with sinous Art Nouveau gold filled filigree overlay, 10.8 cm long; early "PAT. PENDING" clip imprint, "2" imprint on posting end, name on cap overlay, #2 Conklin nib is a smooth writer with considerable line width variation. 11379: Conklin 2: black hard rubber screw-cap crescent-filler with sinuous Art Nouveau gold filled filigree overlay, 12.9 cm long; early "PAT. PENDING" clip imprint, #2 Conklin nib is a wet writer with considerable line width variation. End of lock ring broken off, but enough remains to secure crescent. 12938: Conklin Jaxon: clipless black chased hard rubber stud-filler, 13.5 cm long, patented variant of Conklin's crescent-filler with a metal lock ring securing the filling stud against accidental actuation. 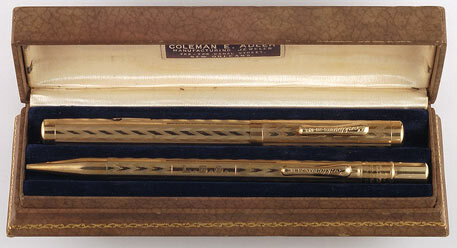 Nearly all of these pens were sold under the Jaxon name, used by Conklin as a sub-brand. Chasing sharper on cap than on barrel, imprints are clearly legible, #2 warranted nib is a later (1930s) replacement (and of better quality than the original #3 warranted). 12202: Conklin S7: oversize black chased hard rubber crescent-filler, 14.6 cm long, gold filled trim, long-tined #7 nib, clip with "PAT. PENDING" imprint; good chasing and imprints, pitting at end of barrel is a manufacturing defect, from porosity in the hard rubber (see detail). Large #7 and #8-size Conklins are hard to find, especially those predating the 75. 11689: Conklin 2: black hard rubber 3/4 length crescent-filler with rose gold filled filigree overlay, 11.3 cm long, "Dot" engraved on cap top and date "1919" in cap cartouche; #2 nib gives much line width variation. 13581: Conklin 4NL: black chased hard rubber crescent-filler, 13.85 cm long, gold filled trim, #4 nib; strong barrel imprints and chasing, cap hard rubber less glossy, more worn. Scant tipping on nib, best used with a lighter hand. 12443: Conklin 75: oversize black chased hard rubber crescent-filler, 14.25 cm long, gold filled trim, big #7 nib is a responsive writer; more wear to the barrel than to the cap, nice sound example of the largest model of crescent-filler Conklin ever offered. 13490: Conklin 2: black hard rubber ringtop crescent-filler, gold filled trefoil filigree overlay, 11.3 cm long, initials engraved in cap cartouche, #2 nib has easy flex. 11162: Conklin crescent-filler: black chased hard rubber, 13 cm long, gold filled trim, original price band, #3 nib. Came to us as part of a pen shop hoard, as new but slightly sun-faded. Has been professionally reblackened (band will slip off the barrel). 13509: Conklin crescent-filler: red hard rubber #40-size, 13.7 cm long, gold filled trim, #4 nib, mottled hard rubber section, rare and fragile model catalogued for only one year; sound and attractive example, minor trim brassing, barrel imprints worn but legible. 11699: Conklin lever-filler set in box: gold filled "all-metal" pen, chevron pattern engine turning, 12.4 cm long, #3 nib, matching pencil uses 1.1 mm lead, both engraved with monogram "L. B. G." but otherwise as new, box virtually perfect as well with New Orleans retailer label. 13105: Conklin lever-filler set in box: gold filled "all-metal" pen, checkerboard pattern engine turning, 12.4 cm long, #3 nib, early long lever with spring-loaded pressure bar; matching pencil uses 1.1 mm lead, both engraved with monogram "H. E. S." Box as is, with outer paper hinge torn, pen and pencil both nice and clean, slightly more wear to the pencil. 12895: Conklin lever-filler: green economy-line model, 12 cm long, gold filled trim, semistub nib; fleabite to rim of cap lip, stress mark to left of nib vent hole (should be stable if nib not overstressed -- was probably treated as a flex nib, which it isn't). 7829: Conklin paper knife: laminated celluloid, 22.2 cm long, imprinted "COMPLIMENTS OF THE CONKLIN PEN CO."; side panels are the same distinctive mottled green used for Conklin pens, tip of blade has been chipped and smoothed. 13114: Conklin Endura: black and pearl lever-filler, 12.55 cm long, gold filled trim, crisp imprints, no brassing, outstanding color, one small dig to the side of the end of the barrel. 11311: Conklin Endura Symetrik set: oversize lever-filler, marbled gold pearl and black, 14.4 cm long, gold filled trim, matching pencil uses 1.1 mm lead, excellent condition, pen shows a bit more usage including a posting mark on the barrel (very hard to photograph). Big Conklin nib is a pleasant and effortless writer. 12221: Conklin Nozac: rare black-veined green marbled piston-filler, 13.6 cm long, gold filled trim, unusual top-mounted clip, barrel marked "PAT. PENDING", otherwise no maker's marks, name on barrel. We have only seen a handful of these pens, which Conklin experts believe to predate the formal introduction of the Nozac line. 11686: Conklin Nozac: black veined grey-green pearl marbled piston-filler, 12-sided fluted cap and barrel, 13.4 cm long, gold filled trim, inlaid gold glitter crescent logo above clip, 5000-word "Word Gauge" scale on barrel; nib opens with light writing pressure, but not far -- nice shading, not full flex.